Sonic and SEGA All-Stars racing is a universal kart racing game from SEGA available for the iPod Touch, iPhone and iPad in the App Store. Happy 20th birthday Sonic! Everybody’s favorite blue hedgehog is back on iOS to celebrate the 20th anniversary of the very first Sonic game, and this time he’s brought some friends along with him. This title is a port of the popular PC and console version of the game, and is a fun and accessible (but still challenging) kart racer. Sonic Racing features ten of the most iconic SEGA characters of the past two decades, including Sonic, Tails, Dr. Eggman, AiAi (of Super Monkey Ball fame), and my personal favorite B.D. Joe from Crazy Taxi. If you’ve played the console version of Sonic and SEGA All-Stars Racing, this title will feel very familiar, and that’s a good thing. This is a very faithful port of the original, only sacrificing a few characters and tracks for this mobile version, however, SEGA did not skimp on any of the graphics or flavor of the game. Every track is detailed and a real pleasure to look at, and the characters look exactly how you remember them in all the classic SEGA games. 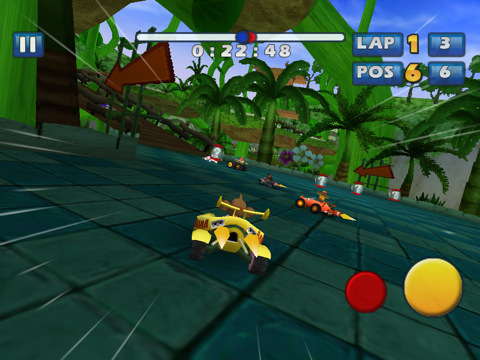 Sonic Racing includes two control styles: the default is motion controlled steering, with a small red button and large yellow button on the right side for braking and drifting, and an item button on the left side for launching attacks on your fellow racers. Alternatively, you can choose to steer with a slider on the left side, and the item button moved to the right side. Personally, I found the slider option to be unsatisfactory, but it’s nice to have the option if you don’t want to be “steering” your iPhone in line at the bank. 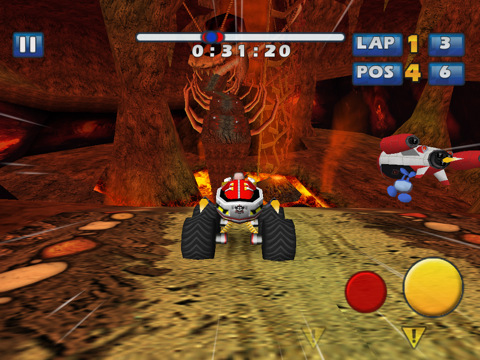 The game features some rather generic music throughout each of the tracks, which aren’t anything overly pleasing to the ear, but are par for the course when it comes to kart racers. I do wish SEGA would have added the ability to listen to your own music while playing (who wouldn’t want to race to Cake’s “The Distance”?). In addition to track music, Sonic Racing features dialogue clips of each character during various parts of the game, which add a nice touch and showcases the individual personalities of each racer. Sonic and SEGA All-Stars Racing is a cute, fun kart racer that’s difficult enough for adults to enjoy, but innocent enough for kids to pick up play. While SEGA falls short of the benchmark set by the many Mario Kart installments over the years, this is still easily the best kart racer available for iOS. With time trials, single races, grand prix and missions to play, as well as local multiplayer via Bluetooth, online multiplayer for up to four players, leaderboards via OpenFeint and Game Center, achievements and unlockables, this title is not one to leave you wanting more any time soon. Sonic and SEGA All-Stars Racing is available on the App Store for $1.99 until June 25th, when it will become $4.99. AppSafari review of Sonic & SEGA All-Stars Racing was written by Alex Seiver on June 23rd, 2011 and categorized under App Store, Fun, Games, iPad apps, Racing, Universal. Page viewed 5332 times, 1 so far today. Need help on using these apps? Please read the Help Page.